Compare at $13893 - Our Price is just $13488! This VW Jetta easily out-handles other small sedans with its tight and well built frame and suspension. 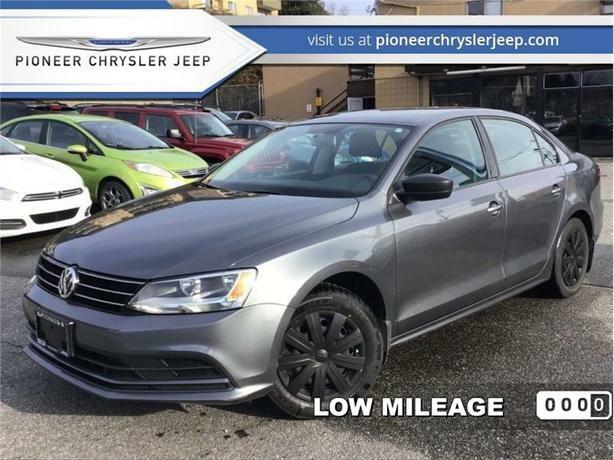 This 2015 Volkswagen Jetta is for sale today in Mission. The 2015 Volkswagen Jetta is a spaciously-sized compact sedan with just enough German personality to favorably differentiate it from the economy-car pack. Jetta receives a variety of updates for 2015. They include front and rear styling changes and new structural enhancements, the latter of which have resulted in improved frontal impact safety test scores. Inside you'll find improved materials quality, as well as several new available electronic safety features. This low mileage sedan has just 44536 kms. It's platinum gray metallic in colour. It has a 5 speed manual transmission and is powered by a smooth engine. It may have some remaining factory warranty, please check with dealer for details. Our Jetta's trim level is 1.8 TSI Comfortline. Settle in and enjoy the ride. Jetta TSI Comfortline features a 16-in alloy wheels, tilt-sliding glass sunroof, chrome side windows trim, Premium 8 sound system with 6-disc CD changer, 6 speakers, touchscreen, SiriusXM satellite radio, dual-zone automatic air conditioning, heated front bucket seats, systems monitor, refrigerated glovebox, Sienna cloth seat trim, and iPod connectivity. / Total cost of borrowing $3580 ). See dealer for details.